An exterior view of the Societa Mutua Beneficenza Italiana (Italian Hall) in Calumet, Michigan. 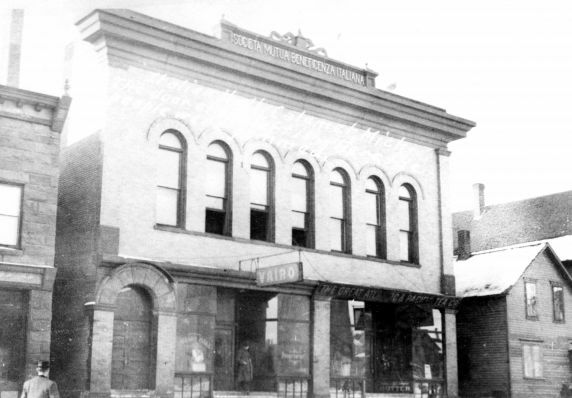 On December 24, 1913, during the height of the Copper Country Strike, the hall was the site of what is now known as "The Italian Hall Disaster." This tragedy occurred after a false fire alarm was called during a Christmas party for strikers and their families on the second floor of the hall. In the ensuing panic 73 people were killed, the majority of the victims being children, after they were crushed at the bottom of the stairwell as they tried to escape. Despite an official inquiry, the man responsible for the panic was never identified, nor was any evidence of a fire ever found.